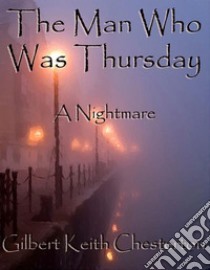 At first read, G.K. Chesterton’s the Man Who Was Thursday is a zany mystery story filled with often surreal twists that turn more traditional thrillers on their ear. Set in a fantastic London where the ridiculous never nears the sublime, our hero, Gabriel Syme revolts against the status quo and breaks out as—normal. Yet Syme’s normalcy provides the perfect foil to illustrate the insanity around him—and for Chesterton to illustrate the insanity he saw in turn-of-the-century London. The Man Who Was Thursday, a masterpiece by G. K. Chesterton, revolves around two of the deepest of all theological mysteries: the freedom of the will and the existence of massive, irrational evil. The two mysteries are closely related. We have a knowledge of good and evil and a freedom to choose, within limits, of course, between the two. Somehow our choices are not totally determined, yet somehow they also are not random, as if decisions were made by shaking tiny dice inside our skull.